According to Adweek, Millennials as teen consumers were virtually ignored by marketers, who were waiting for them to acquire discretionary income rather than engaging them early. Only later did brand marketers realize that with early access to technology and social media, Millennials became the first generation to consume and influence much earlier than previous generations. By the time the lightbulb came on for many brand marketers, it was too late – that ship had sailed. Enter Generation Z. Known as the digital-first generation because they are the first generation never to have lived without smartphones, iPads, or Instagram, Gen Z’s influence and spending power can’t be ignored. Currently influencing $600 billion in family spending, Gen Z’s early exposure to technology has influenced their mindsets and behaviors, resulting in their forming opinions about brands with which they and their families interact. Brand marketers should be clear on this opportunity and not make the same mistake twice. Today’s marketers can reach Generation Z by truly understanding how they think and what is meaningful to them. Following are some things to consider. Unlike Millennials, Gen Z has a desire to own things. Millennials may have been content to share living spaces, cars, and even clothes, but things are changing as Generation Z enters adulthood. In fact, 92% of Gen Z plans to own their own car, and 57% would rather buy a home than rent. That desire to own things can manifest in a desire to share their favorite brands with people. Step One: Shell out the cash. Step Two: Share it on social media, right? This generation is looking for experiences that are authentic and inclusive. For any marketing to resonate with this age group, brands must leave behind the tired stereotypes that were successful with previous generations. Remember those Axe commercials where the focus was on girls lusting after the great-smelling guy? Today, the brand has left behind its history of in-your-face masculinity and taken on a more mature tone. Its #PraiseUp campaign is designed to combat the outdated male stereotypes and instead challenges brand fans to lift each other up with praise. This new image strikes a much better tone with Generation Z, 56% of whom use gender-neutral pronouns. Remember how Generation X loved their big brands in the 80s and 90s — back when luxury implied exclusivity. Today, the name of the game with Gen Z is inclusiveness. While Generation Z will look to influencers and celebrities to discover new brands, they don’t want to be told what they like or how to think. In fact, they would prefer to be in on the creationof their products. That inclusivity stretches to interactions, too. This generation wants to know they’re appreciated, which for brands means that they need to seek out ways to genuinely engage with this group. Consider Glossier, which features their employees and customers as models instead of projecting unattainable beauty standards. Coach also allows buyers to design and customize their bags with specialized charms, details, and monograms. If there’s one thing Generation Z has in common with their predecessors, it’s the desire to find brands that are willing to give back in some way. The Noble Edge Effect that made Millennials fans of TOMS, Patagonia, and Warby Parker is still very much a force with younger buyers. Consider teen favorite Nike, which offers student and military discounts. They also have a commitment to sustainable innovation. Another favorite, Supreme, recently announced that a portion of their latest T-shirt sales would go to help immigrant families and the ACLU. Yes, you can hear it. Generation Z’s voice is getting louder. To connect with this important audience, brands need to understand their behaviors and capture their attention. They also must have a unique perspective on issues that are important to this group, and be prepared to contribute to the conversation in an authentic and meaningful way that moves the conversation forward. Forcing something that’s not a natural fit with your own brand values simply won’t work. 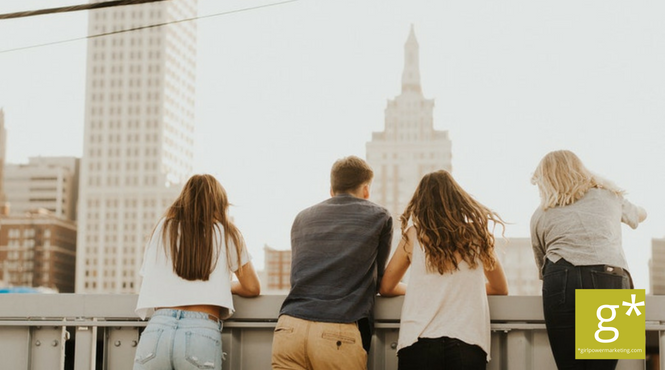 However mysterious and contrary Generation Z may seem, marketing your brand doesn’t have to be difficult. Just remember: Don’t stereotype. Be your most authentic brand self. Look to give back. And make sure your brand marketing is keeping up.